Operatives of the Anti-kidnapping Unit of the Imo State Police Command have arrested three persons for alleged robbery and r*pe. 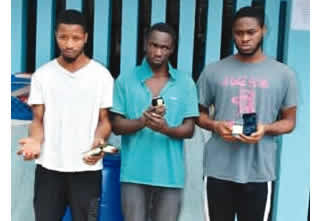 The state Commissioner of Police, Dasuki Galadanchi, who paraded them in Owerri, the state capital, said a gun, cartridge and phones, were recovered from the suspected hoodlums. 21-year-old Marcel Iwuchukwu, Agim Ugochukwu, 22, and Ifeanyi Chukwu, 23. CP Galadanchi said, “On August 8, the operatives of the Command Anti-kidnapping Unit responded to a distress call at Laurel Suit Hostel behind Imo State University. The suspects specialised in armed robbery and r*pe of innocent victims within the area. The suspects had made useful statements to the police. While promising to prosecute the men, the CP said the Inspector-General of Police community policing strategies, which his command was implementing, were yielding results in the state.